1.How the charge will flow? 2.If length of a conductor and it’s radius is increased twice, how the resistance will change? 5. Which of the following conditions represent more resistance at constant temp? 6. There is a wire of length l and cross section A. Which of the following have least Resistance? 7.On which of the following parameters specific resistance depends? 8. 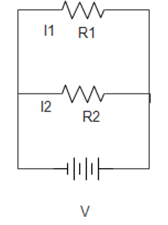 A resistor of length l is connected to a battery and current I is flowing through it. If it is divided into 3 parts by length, and all are having same cross sectional area are connected in series with the same battery, the current flowing through them will be? 9.Two resistances R1 and R2 are connected with a cell in parallel. Find the ratio of current flowing through R1 to the current flowing through R2. 10. Which of the following statement is true regarding Ammeter and Voltmeter? (d)They can be connected in any way. How the charge will flow? Charge fill will flow if and only if potential difference is applied. If length of a conductor and it’s radius is increased twice, how the resistance will change? According to OHMs Law, the potential difference is directly proportional to current if temperature is constant. Which of the following conditions represent more resistance at constant temp? 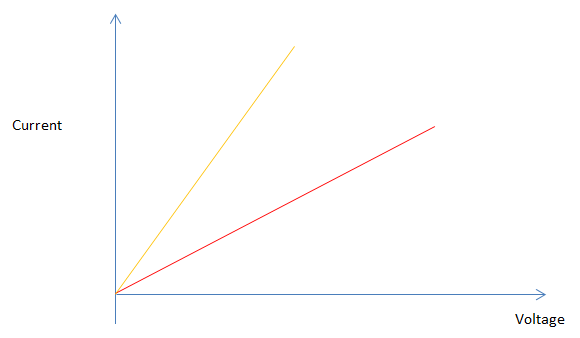 Since V=IR by the OHMS LAW,I=V/R, so slope of the graph is 1/R, more the slope more the value of 1/R, and hence less the value of R and vice versa. The slope of red line is less than yellow, therefor red line will have more resistance. There is a wire of length l and cross section A. Which of the following have least Resistance? Since, resistance increases with length and decreases with cross sectional area. On which of the following parameters specific resistance depends? The specific resistance or the resistivity depends only upon the temperature and the type of material used. A resistor of length l is connected to a battery and current I is flowing through it. If it is divided into 3 parts by length, and all are having same cross sectional area are connected in series with the same battery, the current flowing through them will be? Net resistance will be same as the previous case because the net length and cross sectional area will not change. Two resistances R1 and R2 are connected with a cell in parallel. Find the ratio of current flowing through R1 to the current flowing through R2. Which of the following statement is true regarding Ammeter and Voltmeter? They can be connected in any way.